Determine how you will reward yourself for achieving each milestone and goal. At the same time, decide how you will penalize yourself if milestones associated with the goal aren’t met. ­SPECIFIC: What specifically do I want to achieve? Your goal must clearly state what is to be achieved, by whom, where and when it is to be achieved. Sometimes it may even state why that goal is important. Not all of these questions will apply to every goal, but it is important to ask all the questions in order to make it as clear as possible. MEASURABLE: How will I measure it? Have you ever heard the saying “What gets measured, gets done”? Measure both the end result and the milestones along the way to attaining a goal. The milestones are signs along the way that will tell you that you are on the right track to achieving your goal. For instance, while your ultimate goal may be to increase your sales to $600,000 a year, you may set your milestones may be to sell $12,000 each week. Breaking a big goal into bite-sized pieces makes the goal more attainable. It is a lot easier to think of ways to sell $12,000 every week than $600,000 in a year. ACHIEVABLE: Can I actually accomplish this goal? You should ensure that the goals you set are achievable. First, you must believe that you can manage to do what you are setting out to do. If not, it is very unlikely you will get it done. This also applies when setting goals for a group. You’ll need to get the group’s agreement and participation in the goal setting process. Secondly, it must be possible to actually accomplish the goal. Be careful however, that you do not limit yourself based on what other people believe to be achievable or not. Set your own standards by understanding your own abilities, strengths and weaknesses. Remember, we grow as individuals, managers and owners only if we stretch ourselves. Building new muscle requires tearing down old muscle or habits. RELEVANT: Is this goal relevant to my larger goals? Your goals must be relevant to what you want to achieve in the short term and the long term. In other words, do those things that are most important and in line with your long term vision and mission. TIME-BASED: By what dates will I start and achieve this goal? A goal is a dream with a deadline. Without the deadline, it remains just a dream. Deciding by when you will accomplish something is a good motivator. 2. RESOURCES. Identify the information, investment, people or other items you’ll need to accomplish each goal. Then determine when and how you will acquire these resources and bake this into your plan. 3. TASKS and MILESTONES. Add the tasks and milestones to your calendar. The most important milestones are the “first steps” – those items that will get you on your way. It often helps to identify and schedule two or three first steps for each goal. 4. REWARDS and PENALTIES. Be sure to celebrate your accomplishments – not only reaching the goal, but achieving milestones along the way. And penalize yourself if you miss a deadline. 5. 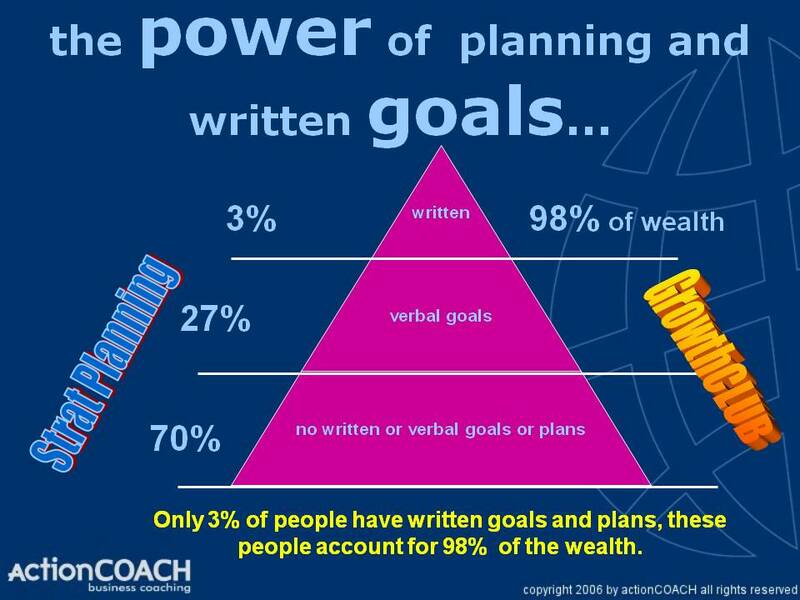 SMART GOAL PLANNER. Use the SMART GOAL PLANNER form to prepare a plan for each of your 90-day goals. You can download the planner by clicking here. After clicking the link, use the File menu to print or download the planner. 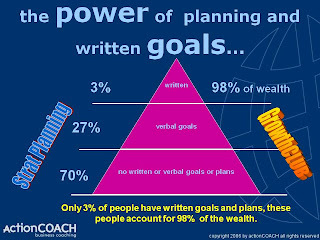 I wanted to ask you where the information behind the 3% of written goals = 98% of wealth came from? Was this published in a study? Thanks!